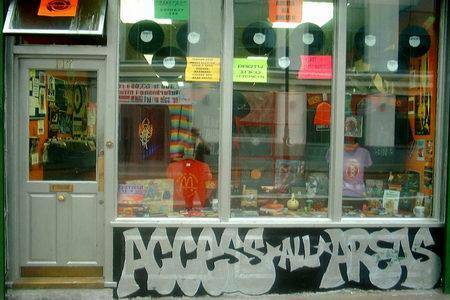 Access All Areas first set up as an information and ticket hub for London’s party scene at the back of a Camden record shop in 1999 before opening up a record shop in Kentish Town in 2002 and then moving to its current (until April 2018) office above Camden Market in 2006. However, AAA was borne out of a desire to provide an interactive space and hub for party people to hangout and engage with each other at London parties. It’s now more than 25 years since Amin Karim, the man behind AAA, first held an information stall – at Club Alien at the Rocket on Holloway Road in 1992 – as he sought to bring a piece of his spiritual and community-minded outlook to parties. AAA was never primarily about selling tickets – it was about community: not just being part of one, but creating the space to nurture and foster one. Values that Amin drew from the Ismaili community in his native Uganda in the 6os and enjoyed with the squatting community in West London during the 70s. The stalls acted as and provided a space to hangout, chat, leave feedback, get creative, find yourself or each other, have a cup of chai or any number of other things Amin thought might get people interacting with one another or relax. Such was the stall’s success at Club Alien and Trancentral that other promoters were soon asking him and his partner Kathy to run stalls at their events too including: PLUR, Synergy Project and Restless Natives. Amin then looked for a permanent base to see if the template he had successfully established at parties to provide a space for like-minded people to hang out and nurture a community could be recreated, but of course it would need to sustain itself. 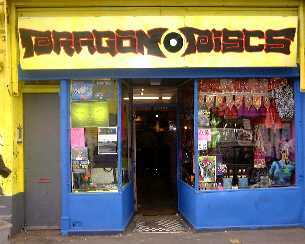 In 1999 the owner of Dragon Discs in Camden, Rocket, kindly allowed AAA to set up a small table at the back of his shop. 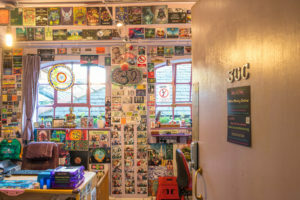 From there AAA began selling tickets, set up a flyer stand and sell handmade carts, crafts and jewellery a long with head-shop paraphernalia and employed a handful of friends as well as becoming the community hub that was its original intention. For the first time AAA was invited to run an information stall at a festival: Sona Luna 2000 in Greece, which would go onto become a regular thing on top of the stalls at London parties. 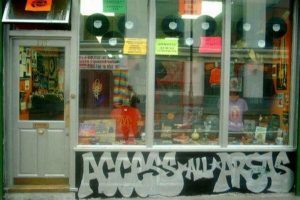 As our community blossomed Dragon Discs sadly closed, so Amin opened up record shop Trackheadz in Kentish Town in 2001 and the fun continued with former Dragon Discs staff Jerome Hill, Mara Bruiser, Syber Symon, Charlie Behrens and Frank One joining the AAA crew of Amin, Johan, Ed Giles and Dan Hart, who between them ran the record shop and AAA respectively. Later recruits included Zebedee, Louise +1, Rob Stow, Ben Onken and Vicki ITA. For those that remember it Trackheadz was the peak of what we tried to achieve: a self-sustaining space for our community to hang out in, get party and activist information and buy tickets, records and clothes as well as our friends hand made arts and crafts. However, for those that worked and hung out there it was sometimes hard to tell when the party ended and the work began – or the other way around. But needless to say it all contributed to building and cementing a community – both inside and outside of parties – that continues to this day. Meanwhile the stalls continued at festivals Glade and Samothraki where we provided all our usual services along with lost property, phone charging and an element of welfare for those that needed some TLC. We also started holding stalls at other large outdoor events including the Cannabis march, Anti War Demo, Reclaim the Future, May Day demo and Stop the Hiding event (anti-domestic violence event). In December 2005 Trackheadz closed down as its lease came to an end, so we found ourselves a small office above Camden Lock market in February 2006 to continue AAA where it focused on event promotion, selling tickets and running information stalls at festivals, however, it continued to act as a space for promoters, party people and friends to connect, catch-up and converse despite most of our work now being done online. Meanwhile the demand for our information stalls (marquees) at festivals grew taking us to some of Europe’s biggest and best festivals that we were proud to be associated with: Ozora, Boom, Boomtown, Glade, Sunrise, Waveform and Sun where providing people with a level of care and courtesy was the aim of the game. Since 2013 we have wound down our activities and focused on the core business due to a family illness and bereavement, which has given reason to question what we have become and what we would like to be, not least the amount of time stuck inside the office. So accordingly and after much thought we will close our Camden office in April 2018. With a large part of the business being conducted online we can be work from anywhere. The new found freedom will allow us to return to what we set out to do: be part of and support the party community, so expect to see us at parties a little more often catching up with old friends and being a bit more proactive in promoting the events they run or attend.